"I perceive education as a way to facilitate those who are interested in their search for a path, the tools to motivate & foster the constant desire for exploration." 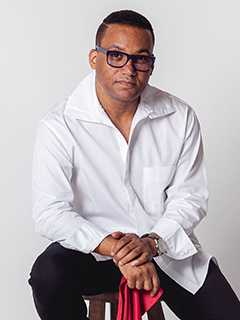 Pianist and composer Gonzalo Rubalcaba is a Studio Music and Jazz lecturer at the Frost School of Music at the University of Miami. Rubalcaba was already a young phenom with a budding career in his native Cuba when he was discovered by Dizzy Gillespie in 1985. Since, Piano & Keyboard Magazine selected him in 1999 as one of the great pianists of the 20th century, alongside figures such as Glenn Gould, Martha Argerich and Bill Evans; won two Grammys and two Latin Grammys, and established himself as a creative force in the jazz world. He was born on May 27, 1963 in a musical family in Havana. His father, pianist, composer and bandleader Guillermo Rubalcaba, had also played in the orchestra of Enrique Jorrín, the creator of cha-cha-cha; his grandfather Jacobo Rubalcaba, was the composer of classic danzones, and his two brothers are also musicians. Gonzalo, a child prodigy who by the age of 6 was playing drums in his father’s orchestra, started his formal training two years later, with piano as his main instrument to, as he once recalled, “just to please my mother.” He graduated from the Institute of Fine Arts in Havana with a degree in composition and by his mid--teens he was working as both, drummer and pianist, in the hotels, concert halls and jazz clubs of Havana. Following graduation he stepped right into the life of the popular musician, touring Cuba, Europe, Africa and Asia with the fabled Orquesta Aragón and also as a sideman in jazz groups and, beginning in 1984, leading his own Afro-Cuban jazz rock fusion band, Grupo Proyecto. His international recording career, which includes titles such as Discovery – Live at Montreux, Images-- Live at Mt. Fuji, The Blessing, Suite 4 y 20, Rapsodia, Diz and Imagine – Gonzalo Rubalcaba in the USA, has garnered him 16 nominations including both Grammys and Latin Grammys. He won Grammys for Nocturne (2001) and Land of the Sun (2004), two collections of Latin ballads and boleros recorded with bassist Charlie Haden; and Latin Grammys for Solo (2006) and Supernova (2002). 2002: Latin Academy of Recording Art & Sciences “LATIN GRAMMY” to Gonzalo RubalcabaTRIO.